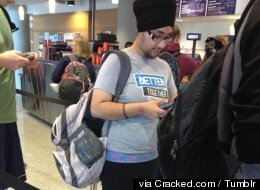 Balpreet Kaur was standing in line at Ohio State’s University Library. Unbeknownst to her, someone took her picture and posted it online. Accompanying the photo was a degrading remark about her appearance. Others joined in as you would expect. Balpreet is a Sikh woman who adheres to the tenets of her faith. Sikhs are forbidden from altering their appearance. She wears a black turban that covers her head when out in public. Balpreet has a hormonal condition that results in facial hair. She’s had this since she was a teenager and sees no reason to remove it. In view of western ways and the emphasis on appearance being a priority, Balpreet stands out as a courageous woman that we can all learn from.